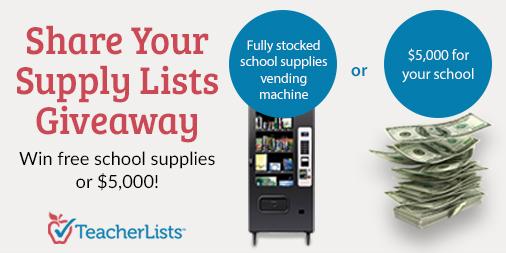 TeacherLists announces today the ‘Share Your Supply List’ Giveaway. Through this giveaway, one school will win a prize totaling $5,000. The grand prize winning school will receive a vending machine fully stocked with school supplies or $5,000. In addition, 25 teachers will win a School Supply stash featuring $200 worth of great classroom products. For the chance to win the grand prize, an educator, school or office administrator, or a school volunteer must upload and share at least four 2017-2018 back-to-school supply lists on TeacherLists.com between June 30, 2017 and August 25, 2017. The first 2,000 teachers to share their class supply lists during this time will be entered to win the School Supply stashes. Anyone who coordinates the school supply list process at a given school, such as school secretaries, technology coordinators, school PTO and PTA volunteers, and school principals, can enter for a chance to win the award on behalf of their school. Signing up for a free account is required in order to create and share supply lists but there is no purchase required to enter the ‘Share Your Supply List’ Giveaway. Since 2012, TeacherLists’ fundamental goal is to make back-to-school simpler and more efficient for schools and parents by bringing the school supply list creation and sharing process to the 21st century. The free online school supply list solution allows educators and administrators a more efficient process to create and share supply lists year-to-year. TeacherLists is also making the process seamless for school parents by allowing them the freedom of instantly finding and purchasing the supplies their children need; every school supply list can be purchased with just a click through select back-to-school retailers like Amazon, Target and Walmart.